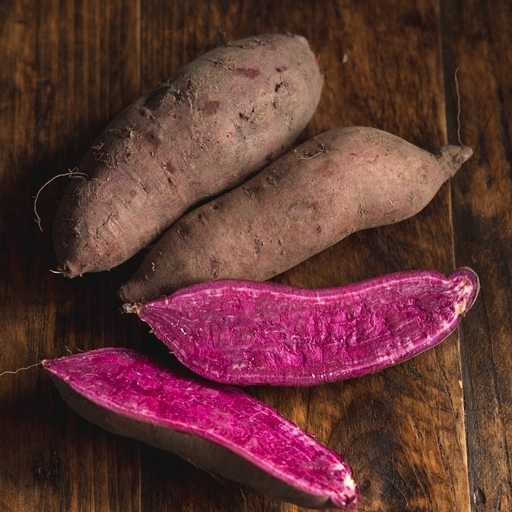 Not just a treat for the eyes, vibrant purple sweet potatoes are a nutritional powerhouse. Their colour comes from a rich concentration of antioxidants (the same ones found in blueberries). Their flesh is a little denser and more floury than standard sweet potatoes, but their creamy flavour is very similar. Good baked or mashed. Sweet potatoes cook a little faster than a conventional spud, so they’re ideal for simple, speedy weeknight dinners. Roast whole, skin on, then top with butter and a scrunch of seasoning, cottage cheese, goat’s cheese, yoghurt with a squeeze of lemon – or anything else you fancy.